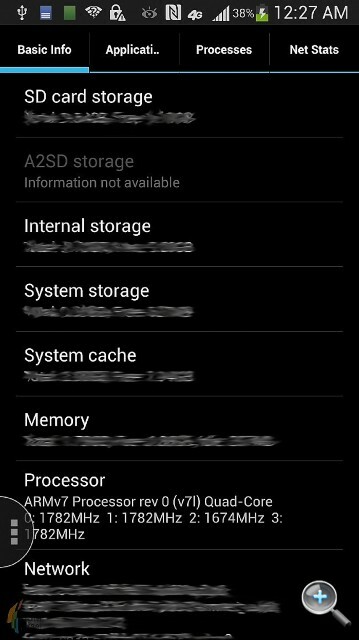 (GSM Insider) - Leaked Screenshots Of Samsung Galaxy S4 Confirmed Smart Scroll, Smart Pause, FHD Display , Quad-Core and 13MP Camera. Exactly seven days, a week to go before the launch of Samsung Galaxy S4. More leaks about this upcoming flagship from Samsung . 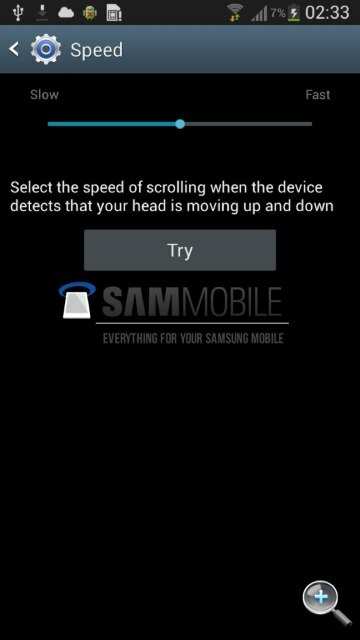 Two reputable sources obtained the screenshots of Samsung Galaxy S4 and confirmed it is indeed features eye-scrolling and eye-tracking technology. The first batch of screenshots is provided by Sammobile. 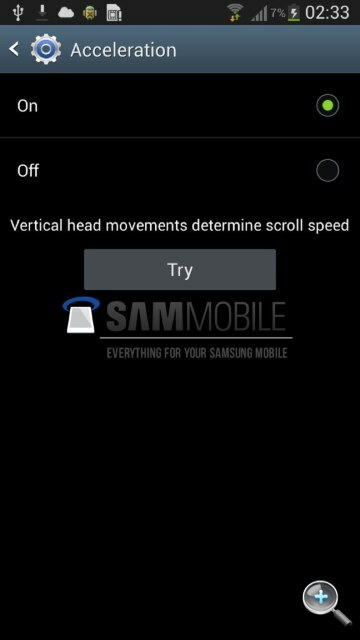 The screenshots showcased that the Samsung Galaxy S4 has smart pause and smart scroll features. 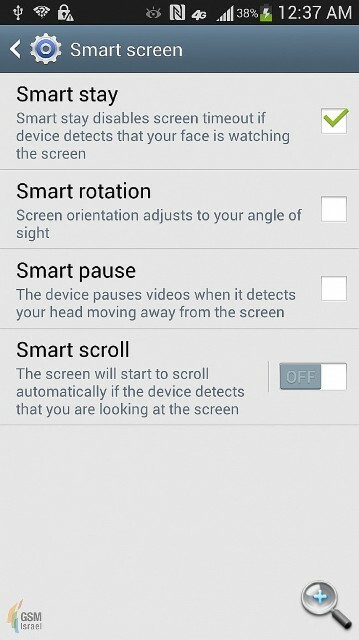 The smart pause feature is the device pauses videos when it detects your head moving away from the screen. 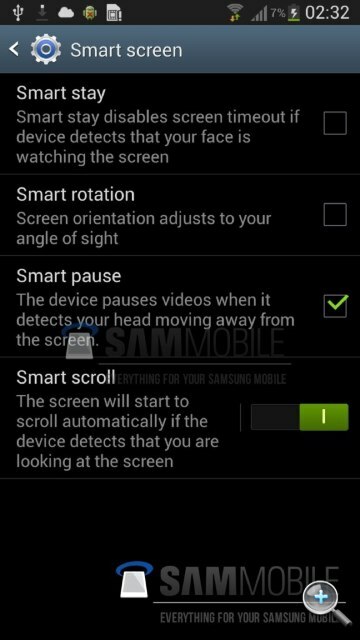 The smart scroll is the screen will start to scroll automatically if the device detects that you are looking at the screen. The second batch of screenshots is obtained by GSM Israel that reveals more information about the Samsung Galaxy S4. 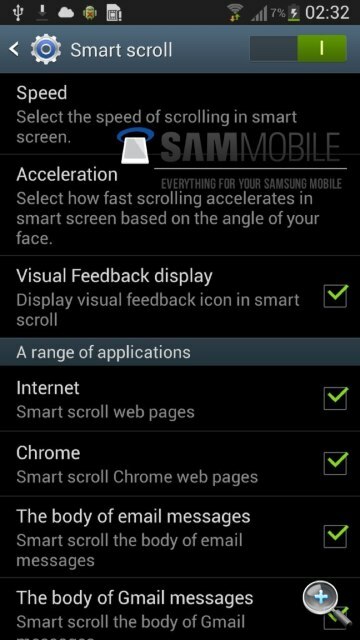 The second batch of screenshots again reveals the Samsung Galaxy S4 features smart scroll and smart pause. The processor of Samsung Galaxy S4 is a quad-core processor that clocked up to 1.8GHz. Sorry, no octa-core processor. So the processor could be Snapdragon 600. The resolution of Samsung Galaxy S4 is 1920 x 1080 and the pixels per inch is 480. So it will eclipse 468ppi of HTC One. Last but not least is Samsung Galaxy S4 has a 13-megapixels camera. The camera has features like face detection, burst shot, metering and anti shake features. Cool. 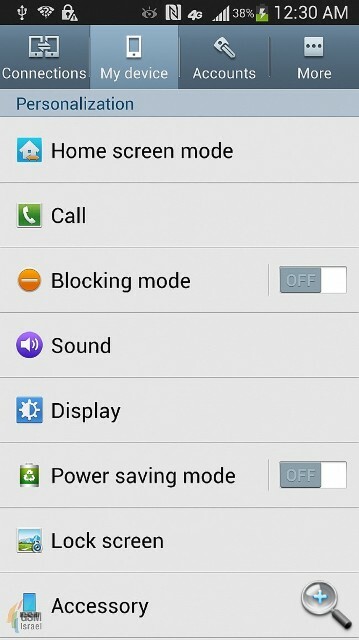 Home screen mode and power saving mode of Samsung Galaxy S4. Samsung Galaxy S4 with a quad - core processor that clocked up to 1.8GHz. The resolution of Samsung Galaxy S4 is 1920 x 1080 FHD and 480ppi. 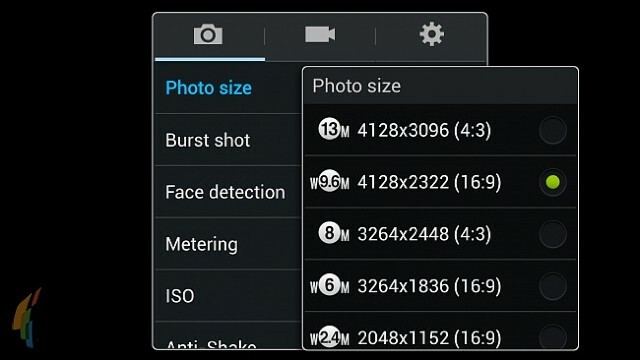 Camera of Samsung Galaxy S4 is 13-megapixels shooter and varieties of features. 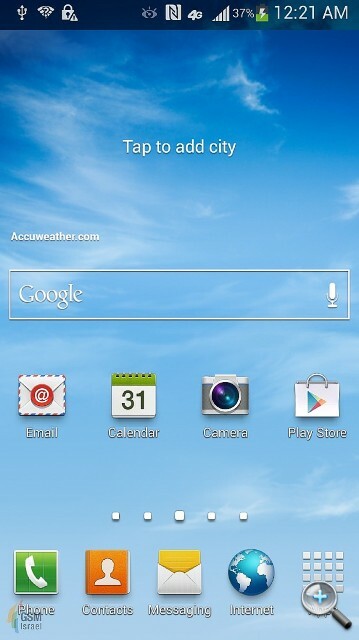 The screenshots from two different sources confirmed many details about the Samsung Galaxy S4. The Samsung Galaxy S4 is powered by a 1.8GHz quad-core processor. The display resolution is 1080p FHD and 480ppi. It is packed with 13-megapixels of camera with multiple features. 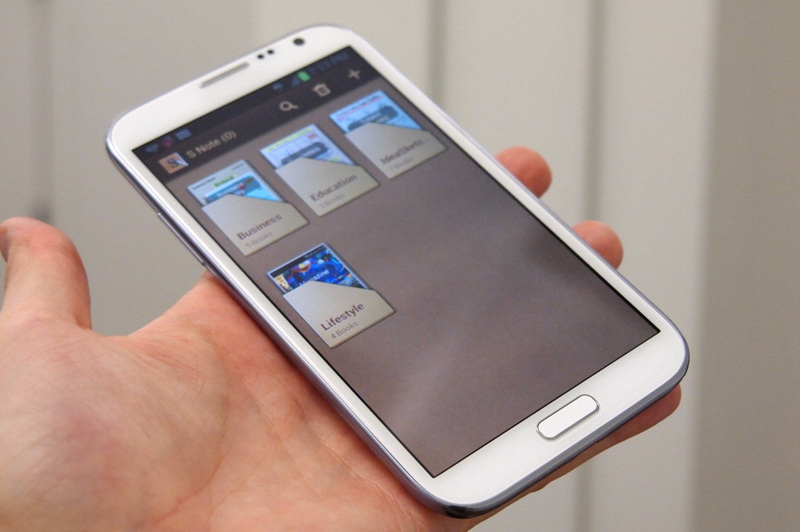 For the software, the Samsung Galaxy S4 has smart pause, smart scroll, smart stay and smart rotation. smart pause and smart scroll are the latest technology from Samsung. Make sure you follow us for the launch of Samsung Galaxy S4 on March 14, 2013. (GSM Insider) - Dakele Phone 2 With Cola OS In Works, Another Competitor For Samsung Galaxy Note 2 With Low Pricing. Dakele Phone is from Chinese manufacturer Dakele. In English, Dakele simply means as the Big Cola Phone. So the second generation Dakele Phone is coming soon. According to the sources from China, Dakele Phone 2 aka Big Cola Phone 2 will feature a newly revamp Cola OS or just Kele OS in Chinese. The Cola OS is based on the Android platform and has its special user interface. The founder of Dakele Phone straightly pointed out at his Weibo that the Dakele Phone 2 will be the competitor of Samsung Galaxy Note 2 in the Chinese market. But the Dakele Phone 2 is definitely cheaper than the 5.5-inch phablet from Samsung. The Dakele Phone 2 is said to feature a 5.5-inch display with 720p HD resolution, 1.2GHz MediaTek MT6589 quad-core processor, 2GB of RAM, 13-megapixels of the main camera, and a 3000mAh battery. The Cola OS will be based on Android 4.1 Jelly Bean. The price of Dakele Phone 2 in China will be around RMB $1499 ($241). 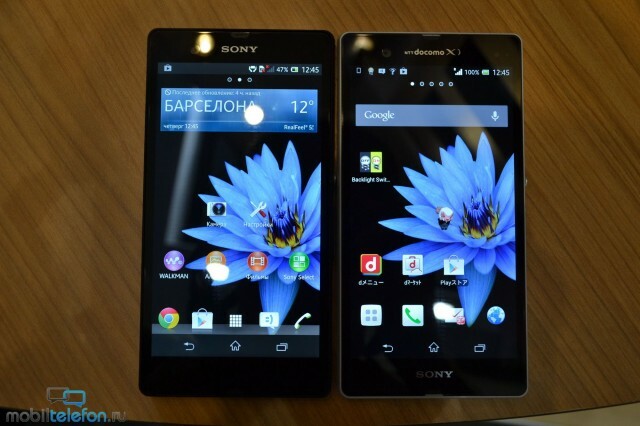 (GSM Insider) - Sony Xperia Z And Sony Xperia ZL Launched In India, Priced At INR 38,990 And INR 36,990 Respectively. Sony India just launched the Sony Xperia Z and Sony Xperia ZL. It was exactly one day after FC Barcelona star Andres Iniesta kicks-off the global rollout of Sony Xperia Z.
Sony Xperia Z and Sony Xperia ZL sharing the same specs like 5-inch FHD display, 1.7GHz Snapdragon S4 Pro quad-core processor, 2GB of RAM, 13-megapixels main camera with Exmore RS lens, 2.1-megapixels of secondary camera, 16GB of internal memory and running on Android 4.1 Jelly Bean. 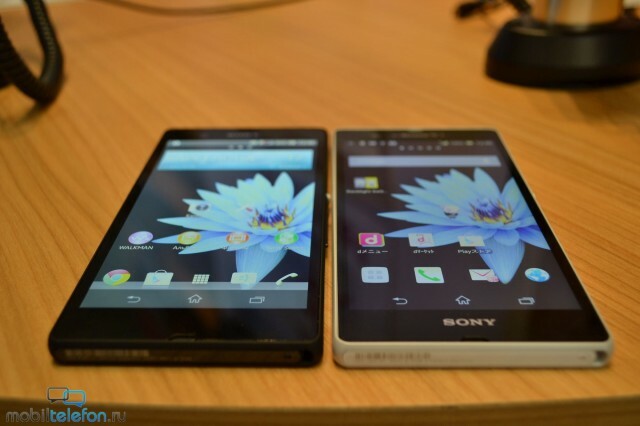 You can check out the differences between Sony Xperia Z and Sony Xperia ZL at this post. Sony Xperia Z and Sony Xperia ZL are set at INR 38,990 And INR 36,990 price tag respectively. 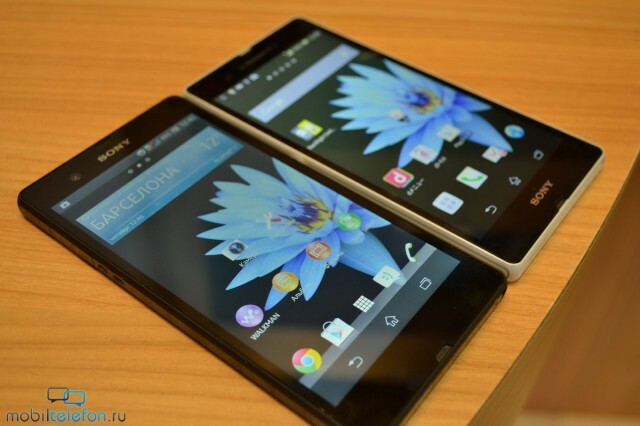 (GSM Insider) - Sony Xperia Z Comparison - European Version (C6603) vs Japanese Version (SO-02E). 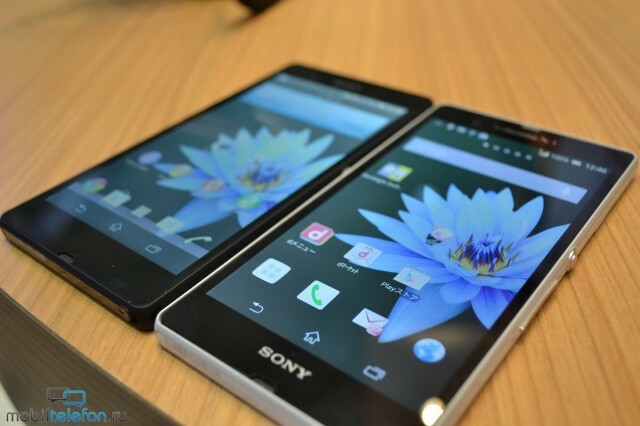 There were news from Japan said that the Sony Xperia Z for NTT DoCoMo with the model number of SO-02E has a sharper display resolution then the Sony Xperia Z for European market. So is the case now? How come different? You can observe from the images below. 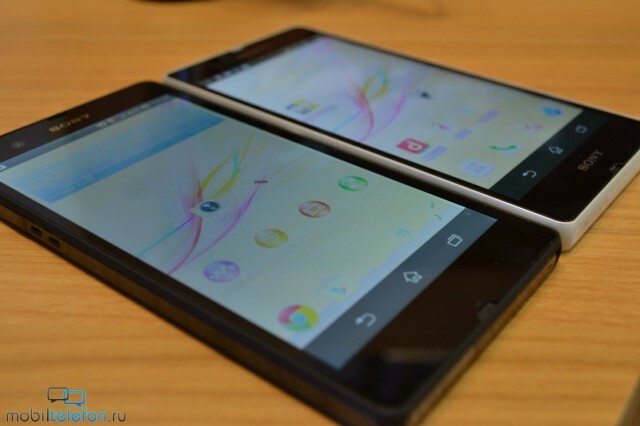 From the observation on both Sony Xperia Z European version and the Japanese version, there are differences between the displays of both devices. 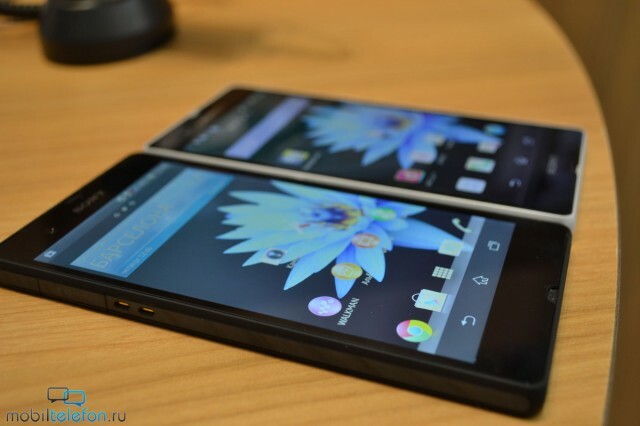 The display of Sony Xperia Z SO-02E is sharper than the Sony Xperia Z European version. As the navigation bar and notification bar of Sony Xperia Z European version are in gray color instead of the black color. 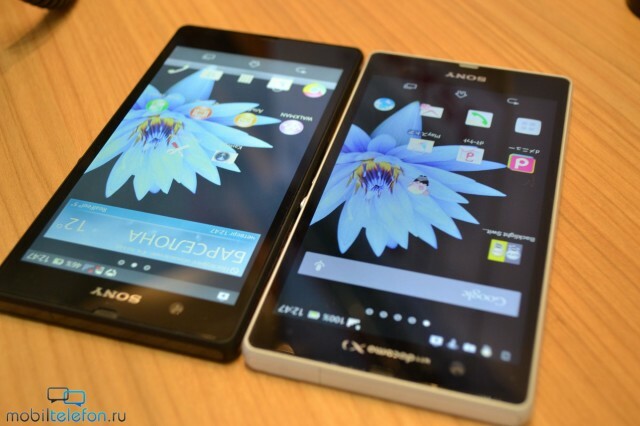 But the Sony Xperia Z SO-02E for Japanese market has navigation and notification bar in black color. 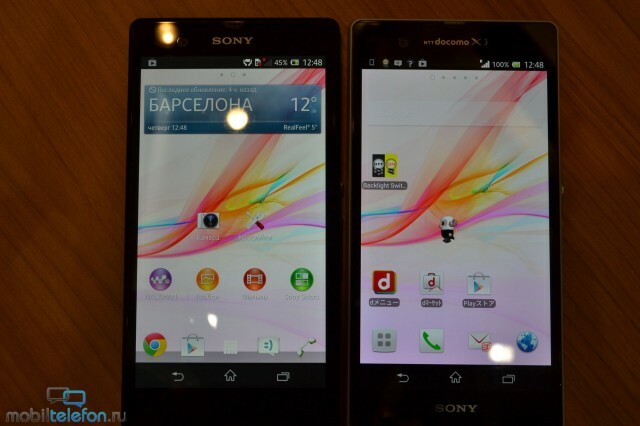 It remains unknown why Sony decided to use two differences colors instead of standardized all in black color. The gray color notification bar and navigation bar of Sony Xperia Z really low down the quality of the device as the display looks not as sharp as other devices in the market. 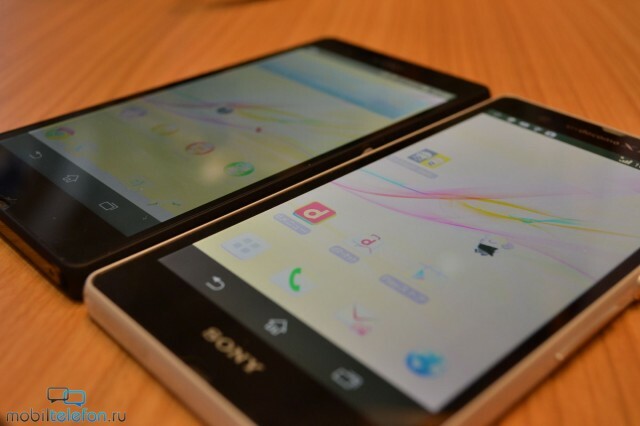 There are many users that dissatisfied with the gray color navigation bar and the notification bar of the Sony Xperia Z. They mentioned that gray color indeed brings down whole appearance of the Sony Xperia Z which is supposedly a high end premium device. They are demanding Sony to solve this matter by release new firmware update or ROM update soon. Do you get it, Sony? 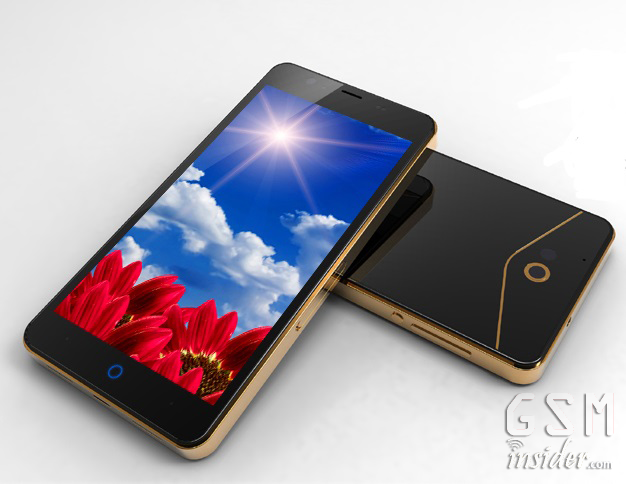 (GSM Insider) - ZTE U956 On Sale In China, Priced At RMB $1699. ZTE U956 has a 5-inch display with 720p resolution, 1.2GHz MediaTek MT6589 quad-core processor, 1GB of RAM, 8-megapixels camera, a MicroSD slot and 2500mAh battery. ZTE U956 runs on Android 4.1 Jelly Bean. ZTE U956 is the ZTE V987 variant for China Mobile. 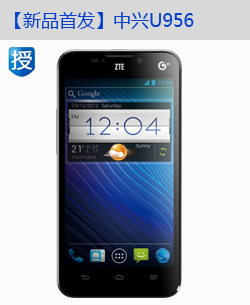 ZTE U956 has been added to compass feature and supported the TD-SCDMA network of China Mobile. The price of ZTE U956 is RMB $1699 which is similar with ZTE V987. (GSM Insider) - Sony Xperia Z On Sale In Malaysia, Priced At RM 2,199. Sony Malaysia just announced that the Sony Xperia Z now available to purchase with the RM2,199 price tag via Sony online store. It brings maximum convenience to customers. Sony Malaysia mentioned that the Xperia Z is only available in black color, neither white or purple available at the moment. Sony Malaysia did mention that the Sony Xperia Z in black on has limited quantities. So it may sell out anytime. Sony Xperia Z has a 5-inch 1080p Full HD display, 1.7GHz Snapdragon S4 Pro quad-core processor, 2GB of RAM, 16GB of ROM, WiFi, LTE, Bluetooth, 3.5mm audio jack, 13-megapixels camera with Exmor RS lens, 2.1-megapixels secondary camera, a MicroSD slot and it runs on Android 4.1 Jelly Bean. 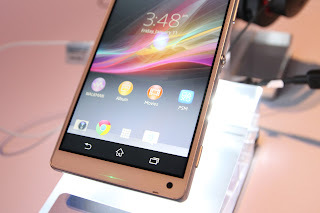 Sony Xperia Z is a dust proof and water proof device. 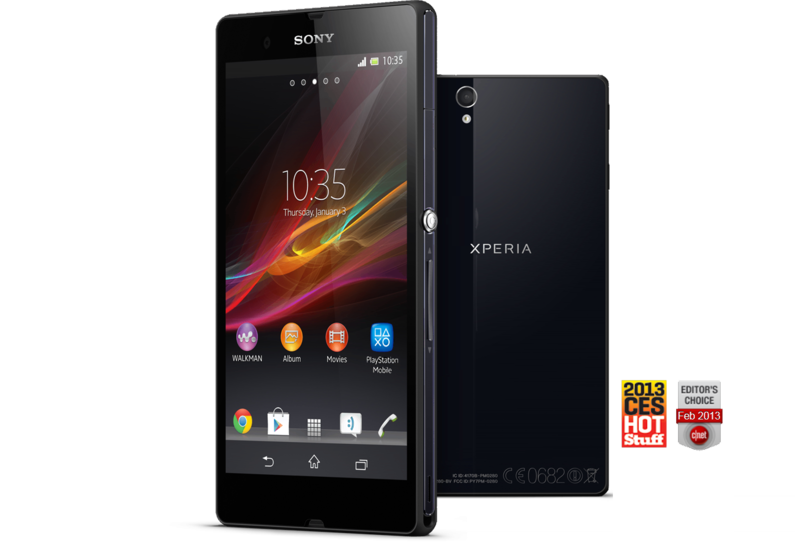 You can purchase the Sony Xperia Z from Sony Malaysia official website at here. 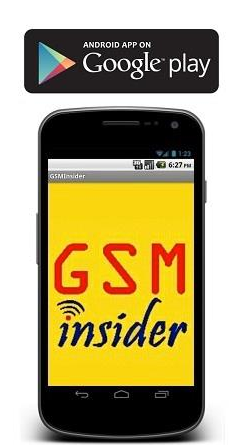 (GSM Insider) - Sony And Barcelona Star Andres Iniesta Kick Off Global Rollout Of Sony Xperia Z.
Sony Mobile starts its global rollout of Sony Xperia Z from Barcelona, Spain. It is the place where Mobile World Congress being held annually. 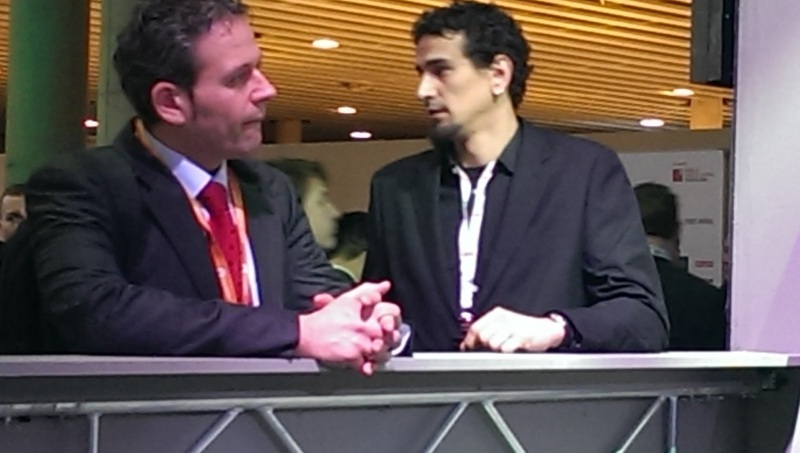 At the launch event, Sony Mobile brings in special ambassador of the product - Andres Iniesta. Spain and FC Barcelona football star, Andres Iniesta was unveiled as the product ambassador of Sony Xperia Z and the Sony Xperia Tablet Z at the launch event in Barcelona. Sony handed Sony Xperia Z and Sony Xperia Tablet Z to Andres Iniesta to mark the global rollout of the Sony Xperia Z smartphone. 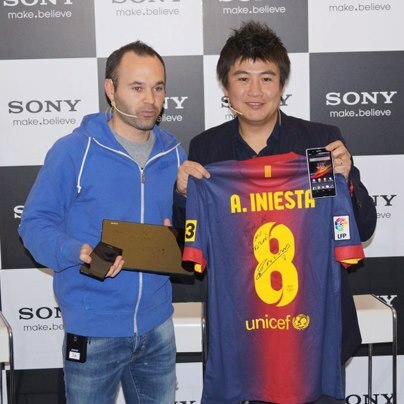 The first ten people that successfully purchased the Sony Xperia Z got the chance to meet with Andres Iniesta. Since the Sony Xperia Z is launching in global market, you can check out the pricing and availability of Sony Xperia Z at local stores. 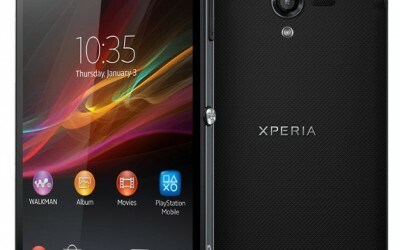 (GSM Insider) - Unlocked Sony Xperia ZL Coming Soon To The America. Sony Xperia ZL has a 5-inch 1080p Full HD display, 1.7GHz Snapdragon S4 Pro quad-core processor, 2GB of RAM, 16GB of ROM, 13-megapixels Exmor RS camera, 2-megapixels secondary camera and runs on Android 4.2 Jelly Bean. The Sony Xperia ZL that heading to the America is the unlocked version that compatible with 4G networks of T-Mobile and AT&T. You can check out the hands-on images of Sony Xperia ZL before making any purchases. 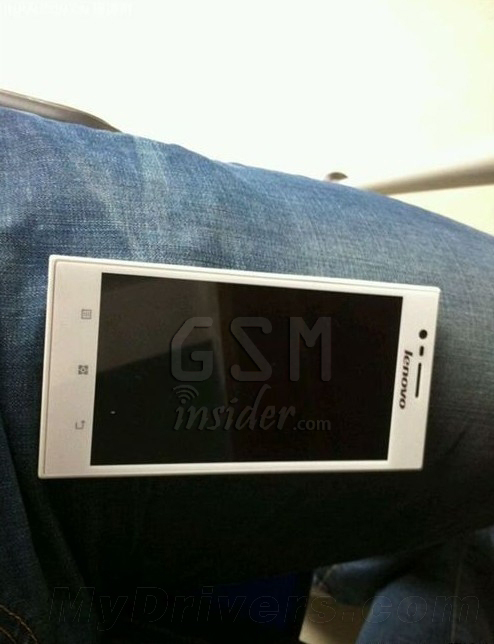 (GSM Insider) - Lenovo Ideaphone K900 In White Leaks, It Looks Super-Classy. Lenovo Ideaphone K900 is not only a powerful monster but it is also a colorful monster. There will be more than four colors of Lenovo Ideaphone K900 coming to the market and the latest color that leaked is the white color. It is also known as the Lenovo K900 in short-form. Previously, the Lenovo K900 has made its appearance at the Mobile World Congress 2013. It was the Lenovo K900 in silver gray that appeared at the Lenovo both. Earlier on January 2013 when the Lenovo K900 was unveiled at the CES 2013, the gold version that made an appearance. Besides gold and silver gray, what's more? Look like the Lenovo K900 is available in gold, silver gray, black and white. There might be fifth color that pop up from China as well. Maybe? Lenovo K900 is the first smartphone with Intel CloverTrail+ processor. It features 2GB of RAM, 16GB of ROM, 5.5-inch Full HD display, 13-megapixels camera and runs on Android 4.1 Jelly Bean. (GSM Insider) - Narudo X02 And Narudo X02P - 5-inch Phablets With 1080p FHD Display, Snapdragon 600, 2GB RAM, 32GB ROM And Jelly Bean. 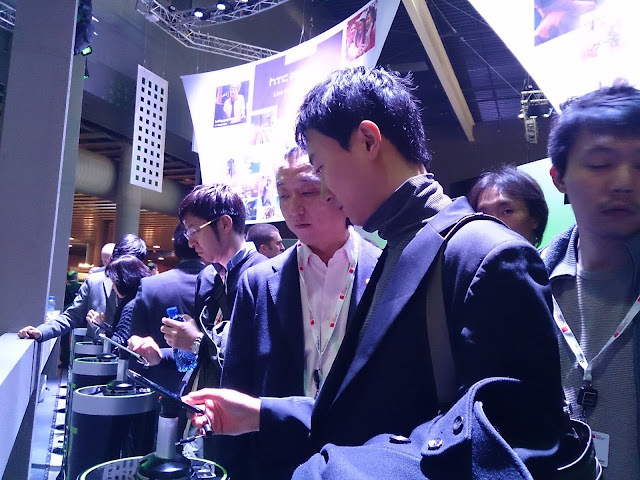 Not only the international brands that introducing Full HD devices as the local Chinese brands also following such trend as well. The latest company to join the 5-inch 1080p club is Narudo from China as it announces two new phablets: Narudo X02 and Narudo X02P. Basically, both Narudo X02 and Narudo X02P are similar in the outlook as well as the specs. The only difference is Narudo X02 is powered by Snapdragon 600 clocked up to 1.7GHz while the Narudo X02P is powered by Snapdragon 600 clocked up to 1.9GHz. Both Narudo X02 and Narudo X02P has a 5-inch 1080p Full HD IPS display with pixel per inch density up to 441. Besides the Snapdragon 600 quad-core processor, both Narudo X02 and Narudo X02P also powered by 2GB of RAM, Adreno 320 GPU and 32GB of internal memory. If you feel the 32GB aren't enough then you can insert a MicroSD card up to 128GB in size. Both Narudo X02 and Narudo X02P have 13-megapixels primary camera and 2-megapixels secondary camera. Other specs include WiFi, Bluetooth, GPS, 3.5mm audio jack, DLNA, WAPI and etc. Both devices are running on Android 4.1 Jelly Bean. Both Narudo X02 and Narudo X02P supported GSM/WCDMA/CDMA2000/1xEV-DO and HSPA+. The measurement is 141mm x 72mm x 10.3mm while the weight is 150g. Both Narudo X02 and Narudo X02P is available in white-silver, black-gold and blue. However, no pricing yet on both devices. (GSM Insider) - Acer Liquid S In Works, Display Above 4.7-inch And Quad-Core. 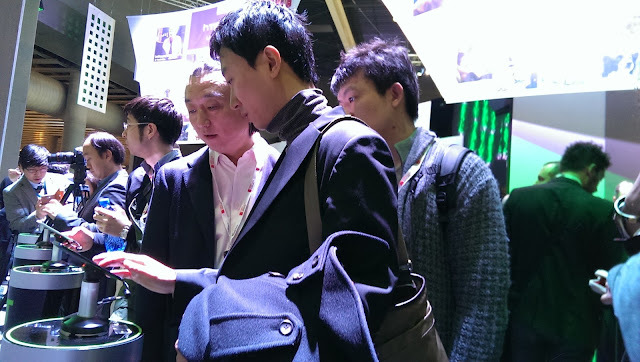 Looks like Acer is on its way to become a real player in the smartphone. You might say that those devices that were launched previously are not attractive and not high end too. But things going to change soon. According to sources, Acer is working on its phablet with the name of Acer Liquid S. The display of Acer Liquid S is going to be larger than 4.7-inch and the processor going to be a quad-core processor too. GSM Insider predicts that the Acer Liquid S could have the display between 5 or 5.5-inch because these two sizes are the "standard" size. If the Acer Liquid S is for the high end market, it could feature quad-core processor like a Snapdragon S4 Pro, Snapdragon 600, Snapdragon 800 or Tegra 4. If it is a budget quad-core processor, then it might feature MediaTek MT6589. Not much information about the Acer Liquid S at the moment. Acer fans out there, we will update you once more information available. 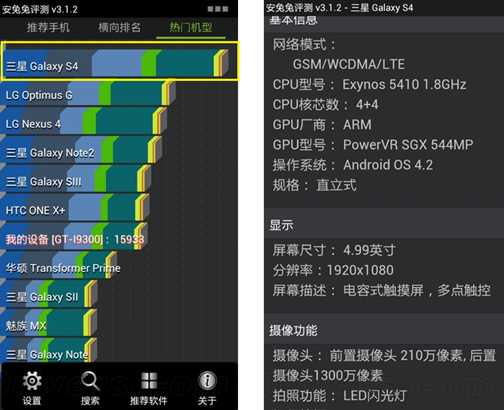 (GSM Insider) - Samsung Galaxy S4 Benchmark Result Leaks For The First Time, Reveals Specs Information. It has been confirmed that the Samsung Galaxy S4 launch date falls on March 14, 2013 in NYC. Samsung invites everyone to join the launch of Samsung Galaxy S4 at Times Square as well on the same date. This must be another unforgettable event. A few days ago, the Browsermark 2 benchmark of Samsung Galaxy S4 leaked. It revealed that the Samsung Galaxy S4 successfully defeated those leading devices at the moment. How about the specs of Samsung Galaxy S4? According to latest AnTuTu Benchmark results, Samsung Galaxy S4 made its appearance as it scores highest points among closest rivals like LG Optimus G and LG Nexus 4. Therefore, the possible specs of Samsung Galaxy S4 revealed at the AnTuTu Benchmark too. 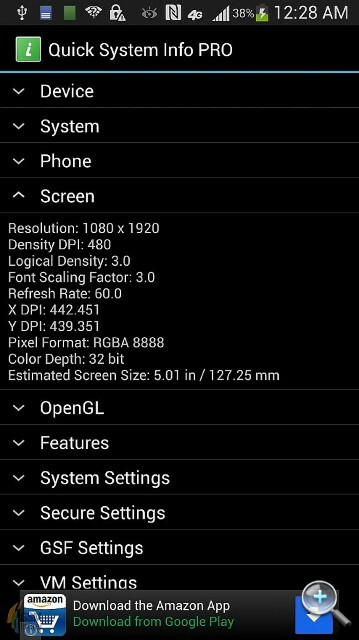 AnTuTu Benchmark revealed that Samsung Galaxy S4 has a 4.99-inch display with 1920 x 1080 Full HD resolution. The processor is the 1.8GHz Exynos 5412 Octa-core processor while it has 2GB of RAM. So, this device could be the Samsung Galaxy S4 global version as the American version could feature Snapdragon 600 and not Exynos 5 Octa. The GPU is PowerVR SGX 544MP. The Samsung Galaxy S4 has 13-megapixels rear-facing camera with LED flash as well as 2.1-megapixels of front-facing camera. The Samsung Galaxy S4 is expected to be running on Android 4.2 Jelly Bean. Other specs include WiFi, GPS and Bluetooth. The AnTuTu Benchmark does reveal Samsung Galaxy S4 has two versions: 16GB and 32GB. Furthermore, the Samsung Galaxy S4 is supported GSM, WCDMA and LTE networks. The question is whether there will be how many versions of the Samsung Galaxy S4? Or the Samsung Galaxy S4 is going to be a 4G LTE device? Will Samsung Galaxy S4 is the first device that pre-loaded with Android 4.2 Jelly Bean? (GSM Insider) - HTC One vs Sony Xperia Z - Ultrapixel Or Exmor RS Better? Camera Comparison. 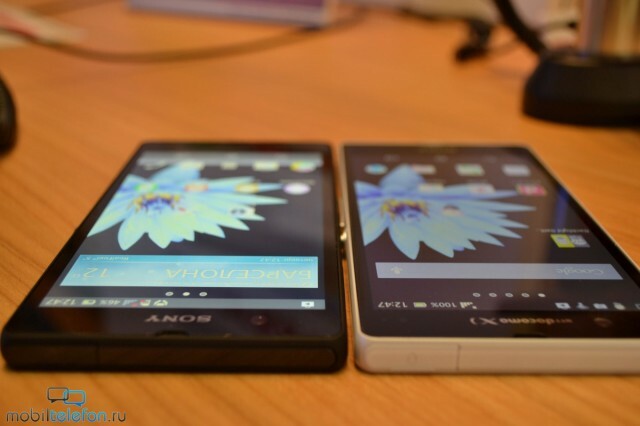 When the Sony Xperia Z was launched, Sony boasted about the ability of the Exmor RS camera inside the device. 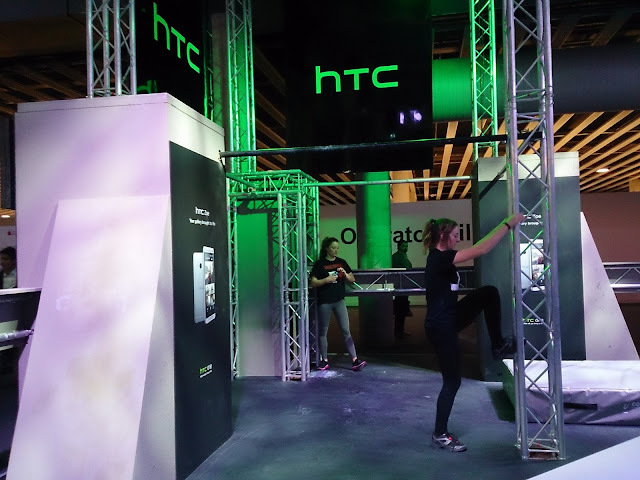 On the other hand, HTC One was launched with the first ever Ultrapixel camera. Actually which one better? 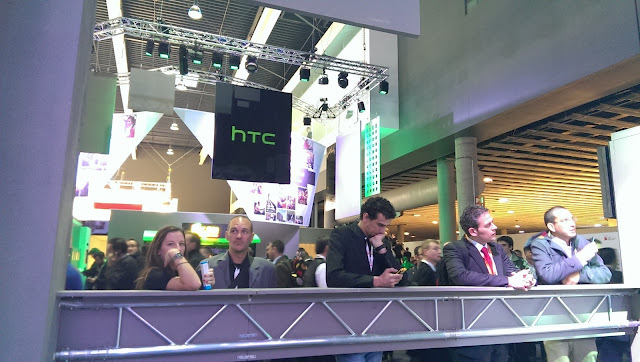 Ultrapixel camera of the new HTC One or the Exmor RS camera of the waterproof Sony Xperia Z? See the image comparison at below. Zoomed in photo from Ultrapixel Camera. The third set of photos was taken under the high contrast situation. It is good to see how HTC One and Sony Xperia Z perform under the high contrast situation. 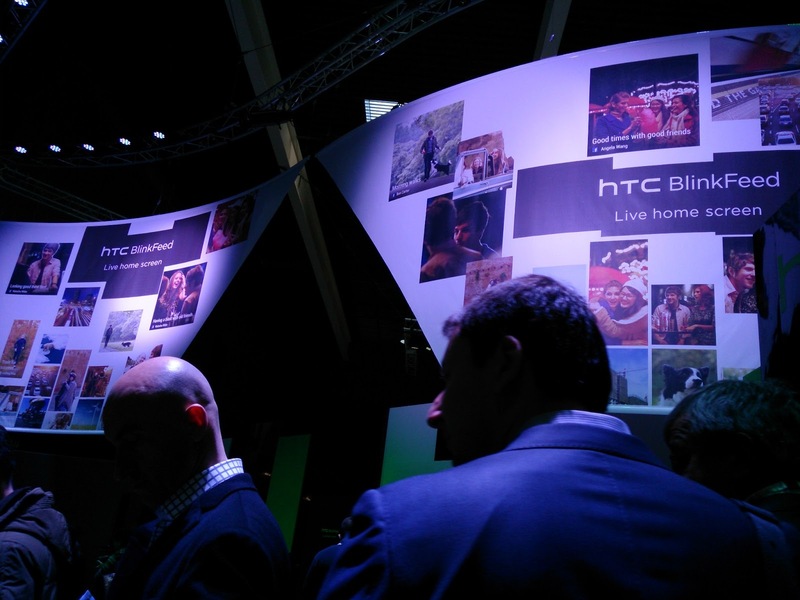 After zooming in both images, the noise level of the photo from HTC One is higher than the Sony Xperia Z. 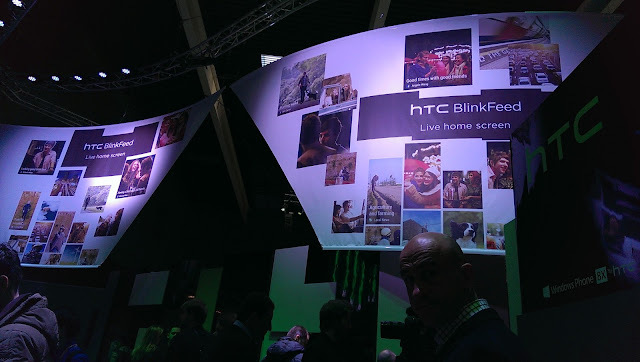 Have a look at the column between two boards, the photo from HTC One has a slightly higher noise level as well. The fourth set of photos was taken from HTC One. Sorry, the fourth set wasn't about Sony Xperia Z. The photo from HTC One that isn't zoom just similar like the photos from other devices. After the Ultrapixel Camera zoom, the photo turned blur like everyone expected. 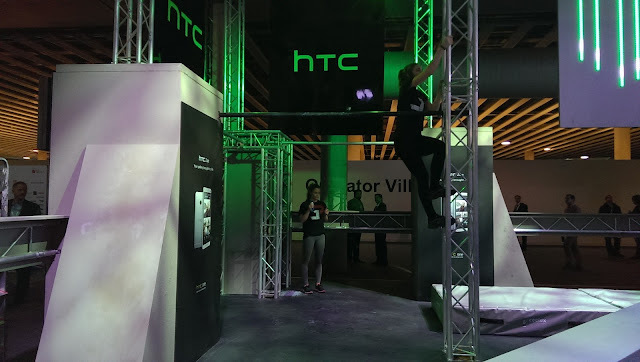 But the Ultrapixel Camera of HTC One performs better than other smartphones in the market. The photo wasn't "so" blur after zooming in, agree? The comparison between the HTC One and Sony Xperia Z is just a guide for you to read on before purchase either one of these devices.